Five years ago British artist Julian Opie was a subject of a major retrospective at the MAK (The Museum of Applied Arts) which concentrated on his, at that time, recent works mainly consisting of portraits inspired by the Dutch golden Age paintings and by the Japanese masters from the 18th & 19th century Ukiyo-e school. A remarkable series of computer-generated landscapes on double and triple screens “Eight views of Japan” (2007), a little oasis amidst animated and still portraits, was based on photographs that the artist took on his many trips to Japan. Clearly influenced by Hiroshige’s landscapes and yet, along with interventions in the visual perspective, unique in their atmosphere of solitude, the views of Mount Fuji came to life with colour, sound or gentle swing of daisy petals in the wind. Opie has developed his interest for Japan upon discovering printmaking masters Hiroshige and Kitagawa Utamaro, whose art he has been collecting for some years now. 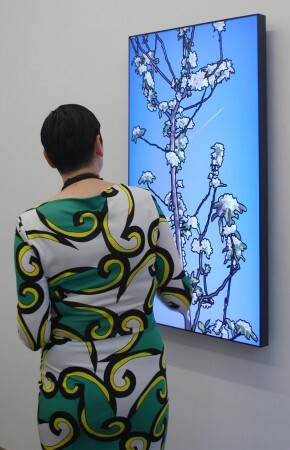 The traces of Japanese influence are still visible in three works shown at the Viennese Krobath gallery at the exhibition opened on June 7th: Evening sun (2011), Apple tree (2012) and Shooting star (2012) (all of them continuous computer animation on 55” LCD screen). Once more, Julian Opie has integrated some moving elements such as a swarm of insects caught by the last rays of the evening sun, stars discretely twinkling in the night, or an occasional aircraft cutting the clear blue sky, barely visible from behind the blossoms of an apple tree. The artist has kept the verticality of classical Ukiyo-e paintings and prints: “The format might be the same, but all of the motives are taken from French landscapes. The Japanese letters are missing and the scenery is different”, explained Opie during our short conversation at the exhibition opening earlier this month. Also shown at the Krobath gallery are seven still French summer landscapes. The colouration of prints, which depict flatlands split almost in equal halves by local country roads, is reminiscent of army camouflage patterns. Apart form occasional shadows cast by the tall trees on a deserted dusty road, nothing disturbs the neat scenery which is stripped of all the creatures big and small. All of seven 112×200 cm inkjets are mounted on toughened glass with aluminium.